Welcome to the San Francisco Leather Pride Contingent! We are a contingent representing the many facets of the San Francisco Bay Area’s Leather and Kink Culture. 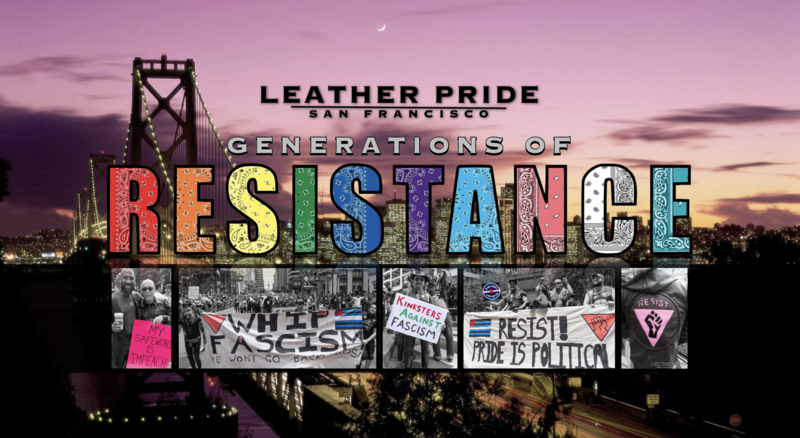 We invite all leather, kink and fetish organizations to join us on June 30th for the 51st Annual San Francisco Pride Parade & Celebration, "Generations of Resistance . The Leather Community has a proud tradition of participating in the San Francisco Pride Parade. In 1999, under the leadership of Robert Davolt we united the many groups to form the Leather Pride Contingent. People clad in leather have been in every pride celebration not only here but in almost all pride celebrations throughout the world. The Leather Culture has a proud tradition of mentoring our next generation and I personally would like to thank Jay Hemphill and Michael Holeman for extending this opportunity to me. It is a true honor to continue the legacy of the San Francisco Leather Pride Contingent and I look forward to seeing you all at the parade. Robert Davolt, united the Leather Community and formed the San Francisco Leather Contingent, in the San Francisco Pride Parade, one of the largest units in the world’s largest Pride Parade. He was selected as the 19th San Francisco Leather Daddy. He has served on the Board of Directors of the Leather Archives & Museum (LA&M) in Chicago, traveling to dozens of cities every year as a teacher, lecturer, radio commentator, fundraiser, contest judge and guest of communities throughout the United States, Canada and Europe. The San Francisco Leather Contingent Banner (above), is dedicated to Robert Davolt and all of those who made an impact in Jay and Michael's life as they began their journey from the shadows. We invite you to visit our special tribute page dedicated to Robert, view some of his articles and reminisce on our Contingent Founder.